Several years of hard work, research and development are paying off for Kyle Luttrell’s Ionic Edge Chassis in 2015 World Karting Association RLV Gold Cup Series action. The Georgia-based kart manufacturer and team accomplished their best national event to date July 3-5 at the Gold Cup Nationals at G&J Kartway in Camden, Ohio, netting two feature wins and many more top-five finishes in Senior and Junior class competition. In the Senior ranks, Dustin Demattia again led the charge. The Ohio driver, who’s in his second season riding an Ionic Edge, hit his stride Sunday in the competitive Briggs LO206 Heavy division, qualifying on pole and winning the heat and feature on his way to a clean sweep of the day’s action. Demattia’s LO206 win on Sunday came a day after finishing second to multi-time WKA Triple Crown champion Gary Lawson Saturday. Demattia also competed in the Senior Pro Gas Animal division as he battles for a national championship after finishing second in Pro Gas points in 2014. Dustin had a solid day Saturday in Pro Gas, qualifying fifth and finishing fourth in the heat race. Demattia drove a great race in the main, finishing second to accomplish his best Pro Gas feature finish of the season. On Sunday, Demattia again ran top five in Senior Pro Gas qualifying and the heat race. He would settle for ninth in the main event. Another Ohio driver — Eric Fagan — competed on an Ionic Edge for the first time ever at Camden. 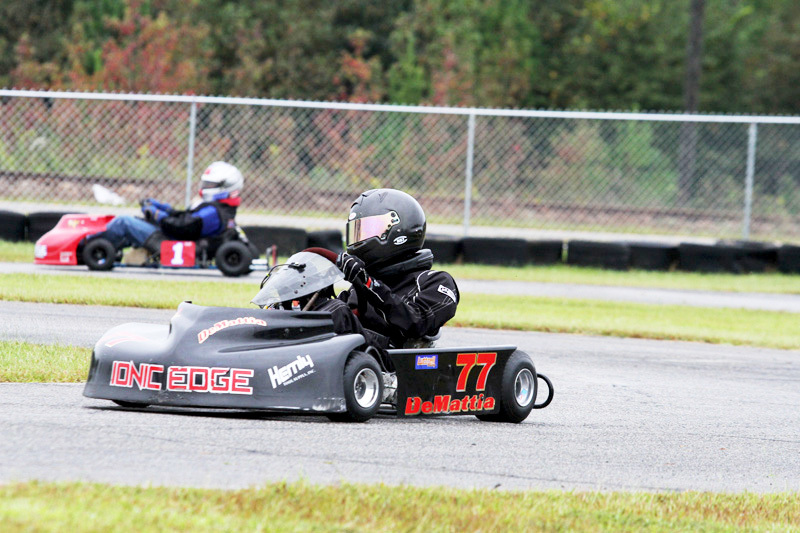 Fagan, a past WKA national champion, was already impressed with his Ionic Edge in the Pro Gas division, and he approached Luttrell Saturday morning about getting on an “Edge” for the competitive LO206 class. Luttrell gave Fagan an opportunity race an Ionic Edge in LO206 Heavy competition, and in his first time in the seat Fagan promptly qualified on pole! Fagan would go on to finish third to Lawson and Demattia in Saturday’s LO206 Heavy main event. Fagan also ran an Ionic Edge in the Senior Pro Gas Animal division at Camden. He collected a solid fourth-place finish in Sunday’s 12-lap Pro Gas main event. Brian VanCleve Jr. and Alex Vrabel carried the Ionic Edge torch in Junior Pro Gas Animal and Junior LO206 racing at G&J. Vrabel netted Ionic Edge its first national win in Junior competition while VanCleve never finished outside the top five in four Junior Pro Gas starts. Vrabel, a new Ionic Edge driver in 2015, broke into the win column for the first time in 2015 season in Saturday’s Junior Pro Gas Heavy main event. After qualifying fourth and finishing third in the heat race, Vrabel bested class points leader Matt Miller by just 0.6 seconds for the big win. VanCleve crossed the finish stripe right behind Vrabel and Miller for a fine third-place finish. Like VanCleve, Alex was a factor every time junior racers hit the track at Camden. He finished fifth in the special 10-lap Shootout race and netted finishes of seventh, eighth and eighth in the three other Junior Pro Gas mains. He also finished fifth in both Junior LO206 feature races. While VanCleve wasn’t able to earn that coveted feature win at G&J, he had a terrific weekend nonetheless. The young Iowa racer notched the fourth position in the 10-lap Shootout and recorded incredibly consistent main-event results of second, third, third and fifth in the four Junior Pro Gas Animal finals. VanCleve came closest to a win in the last race of the weekend – Junior Pro Gas Heavy 2 late Sunday afternoon. Brian crossed the finish stripe just one kart-length back of winner Cody Hall in the feature. “We’re really proud of Brian and Alex’s performances at Camden, and throughout the Gold Cup season. Alex getting that feature win was awesome and it was our first in junior racing at the nationals. He’s a great driver and he proved it at G&J. And Brian, he deserved a win as much as anyone and even though he didn’t get it, he raced his heart out and came home with four top-fives, and three of them inside the top three. And just as important, he kept the kart right side up! He flipped the first two Gold Cup races of the season,” Luttrell said with a smile. The team will now focus on preparing for the 2015 Gold Cup season closer Sept. 25-27 at Barnesville, Georgia’s Lamar County Speedway.